The sofa is probably the most expensive piece in your living room. It's the most commonly used piece of furniture. The sofa is usually the anchor piece of your lounge. Sofa and Settee's with backs and arms, many a time upholstered are designed for accommodating two or more people in a reclining or sitting position. The earliest surviving kinds that date back to the 17th century in Europe possess sides which let down for transformation into bed. Variations of armrests and backrests appeared and its precedent yet followed in the 21st century. Various types of settees or sofas were rendered names that derived from their style, function or anything associated with them. You just add a brand layer of function and elegance to your living room with sofas and settees from our collection. 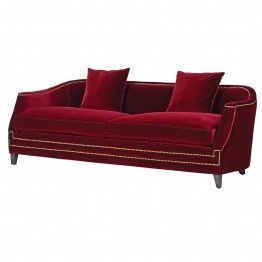 Such classic pieces are generally designed to accommodate comfortably two or more people. 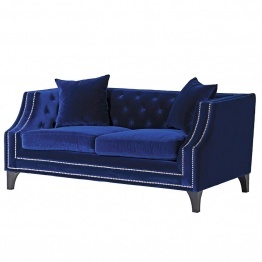 Our settees’ collection comes in standard, Chesterfield, sofa beds as well as convertible styles. You can select any upholstery matching with the décor of your room. Our sofas are grouped with armchairs that are another essential classic look to your room. Furniture is not only an interior piece, in fact; they enhance the beauty of your room where they're positioned. French sofas that are considered as a statement of style and uniqueness. They are the great addition to your room and hold the importance in itself. You can never deny our quality, style, variety and number of contemporary styles are offered at la Maison Chic that fits every area in your home. Whether it's the living room, drawing room, bedroom or study; many styles are available which themselves demonstrates their uniqueness.